What is South Brooklyn Weightlifting Club? 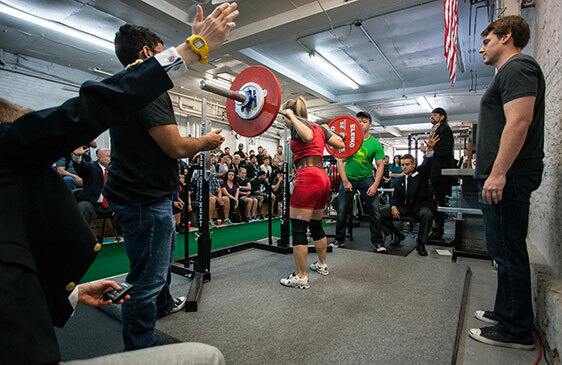 South Brooklyn Weightlifting Club (SBWC) is a private training facility founded around the barbell sports of Weightlifting and Powerlifting. It is also known as a black iron gym. A black iron gym is one that is comprised primarily of free weights, barbells, power racks and benches. The beauty of a black iron gym lies in its simplicity. We only need a few tools and the knowledge of a good coach to create an amazing training session where the participant will increase their skill and their strength. This also eliminates the need for single-purpose, deliberately limiting weight machines, gimmicks, trends, and the like. Our facility is probably very similar to a physical culture center that your grandparents might have belonged to. Why would I want to train at SBWC as opposed to anywhere else? Simply put, old school barbell training works! It benefits overall health. At SBWC we focus on multi-joint, full-body movements that maximize your body’s potential to get strong, increase bone density, and move in a productive and functional manner. I’ve heard a lot of stories about gyms like this. Will I get a hard time if I am small, weak, or uncomfortable in commercial gyms? Absolutely not! SBWC offers a fun and inclusive zen-like training environment. Classes and training sessions are always monitored by an experienced coach. Lifters train in a supportive, team-like atmosphere where everyone shares the same goal. People go to SBWC to get stronger physically and mentally. In a sense, your strength when you start at SBWC is irrelevant as you will very quickly improve your skill and your strength. All you have to do is show up and we’ll put you on the correct path! What is a training session and what is it like? Our training sessions are supervised training groups of up to 12 lifters. Each lifter will be following a program that has been written by one of our coaches while interacting with the other members of SBWC. Often there are several lifters who are following the same regime, although their weight loads may be different. A qualified coach runs the session and gives cues, calls for spots, and guides each person through the workout. They will make sure that everyone takes right amount of rest, lifts safely, pushes themselves to the best of their ability. It is an inclusive and inspiring environment. We liken SBWC to a dojo (a hall or a space for immersive learning…). We want everyone to enjoy and respect their training. In order to get the most out of a training session, a lifter must expect honest feedback, be prepared to stay focused on lifting, and to be present! Forget all the other worries of your day, put away your cell phone, and train in the moment! Why are there no mirrors or music at SBWC? Communication, focus, and accuracy are the keys to a positive experience at SBWC. Mirrors have a way of creating false feedback and can cause a lifter to spot themselves incorrectly. Furthermore, you always have a coach at SBWC. It is important to absorb the information that they are relaying to you. Coaches can see better than an individual looking at their reflection in a mirror. As for the music, we need to be able to talk with each other, to give cues, and to interact both coach-to-lifter and lifter-to-lifter. Ambient music – and, yes, personal music – don’t allow for this to happen. Besides, a room full of people can never all be happy with the choice of music. Finally, we encourage you to use the energy in the gym and internal dialogue to motivate yourself. Great! I’m interested. How do I get started? E-mail Paulie! If you don’t have any experience lifting, haven’t done it in a while, or want to change from one type of lifting to the other (Powerlifting or Weightlifting), there are a few options. Sign up for a preparatory 3-session private course, or you can do a single powerlifting or weightlifting private session if you just need to brush up on your skills. Sign up for our Intro to Powerlifting class. This course takes place over a month and allows you to learn the lifts, proper technique, and all of the elements that go into powerlifting. It prepares you to be comfortable in a lifting environment. Plus, you work with a small group of fellow lifting enthusiasts who are learning right along with you. If you have some experience already, we will take you through a mandatory evaluation so that we have a clear picture of you as a lifter. Regardless of your background, Paulie will want to talk to you one-on-one to find out more about your athletic history, goals, and to find out about any physical concerns…so be prepared! I would love to join, but I am from out-of-town. I will be in the area for a bit and want to drop in. Is that possible? Yes! Out-of-town guests can drop in for $20 per visit. You can come by at any time that is designated as a “Coached Session – All Levels” training block. The up-to-date schedule can be found here. Although the slots are listed by the hour, trainees may be at the gym as long as they need to in order to finish their training up to the time that block of sessions ends. For example, if you come by for the 7pm on a Tuesday, you can work until 9pm.